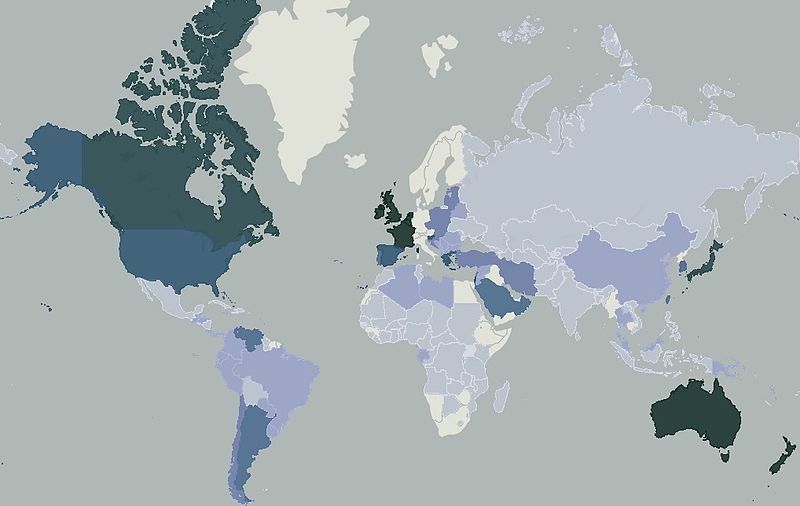 Another great place to check is here which compared GDP per capita or essentially how much value each person is adding to the total country GDP. Just comparing these first two maps, population and wage, it appears that the most populated areas have the lowest wages. Sounds like a natural place to start then, right? Looks like countries like China and India would be the initial winners if these were you only two factors. But the assumption though would be that just looking at areas with lots of people and low wages would lead to low quality workers. So, lets see what we can find out about quality and the education of workers around the world. It was interesting to me to see those pockets of bright red and dark black in India so be particular about hiring there. Also enlightening were the vast areas of darkness in northern Asia, most all of Africa as well as center South America. Here are some additional great reads on Countries by Average Internet Speed and Countries by % of Population that Uses the Internet. Be sure to spend some time browsing around these maps based on your particular hiring need of the moment. Definitely appears you should stay away from central Europe if you are more likely to lose your wallet. then I hope you found this post helpful. Either way, I would love your candid insight into what countries you hire from now and why you from them as well (if you know) in the comments below.